It's a quick and convenient transport. 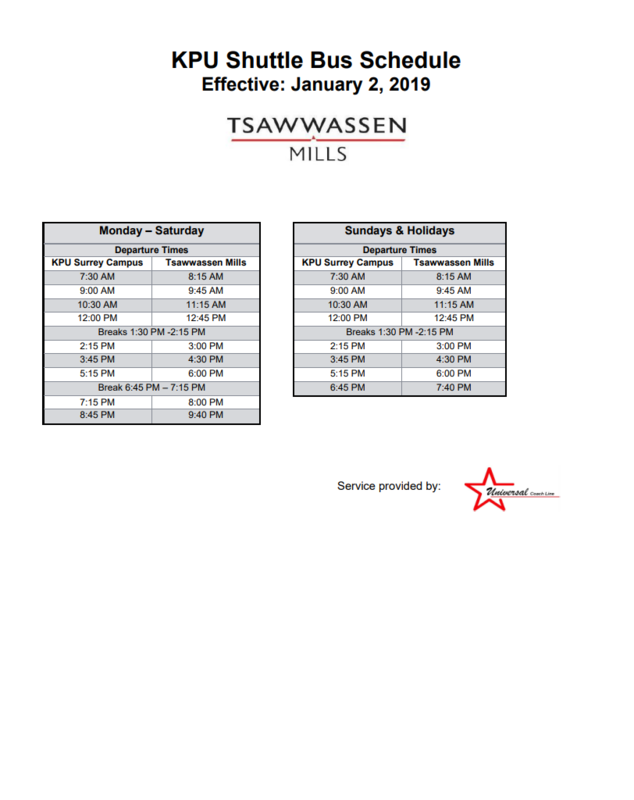 We offer you 3 FREE shopping shuttles to Tsawwassen Mills. Our exclusive 48-passenger luxury coach provides COMPLIMENTARY round-trip service twice a day from 2 convenient locations to Tsawwassen Mills. *No bus on December 25. **Including statuatory holidays: Feb 18, April 19, May 20, Oct 14, Nov 11. The shuttle operates on a first-come-first-serve basis. Shuttle riders must wear their wristbands to ensure return trip. Please arrive at the pick-up location at least 10 minutes prior to departure time to check in with our Bus Ambassadors and get your wristband. Our exclusive 42-passenger shopping shuttle provides free round-trip transportation from Tsawwassen Ferry Terminal to Tsawwassen Mills daily, coordinating with the Nanaimo and Victoria ferry sailing times, during mall hours. 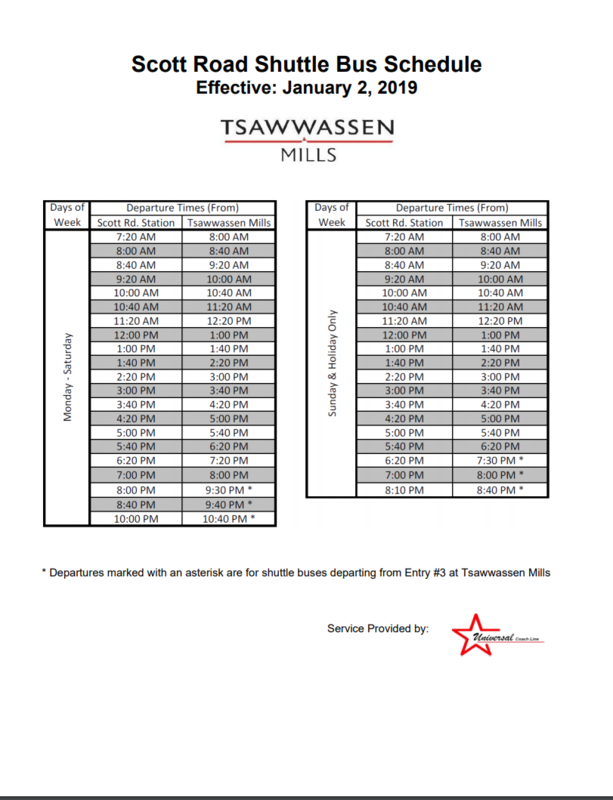 Download a more detailed schedule of the Tsawwassen Mills Shuttle & Ferry Times. Arrival and departure schedules for Tsawwassen Ferry terminal per BC Ferries. 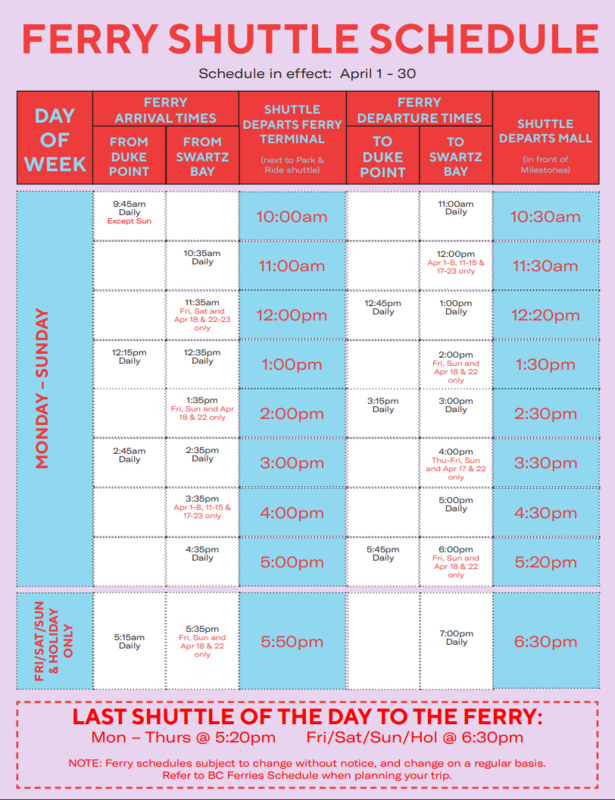 Shuttle schedule subject to change as ferry schedule changes. The complimentary service for shoppers consists of two 29 passenger shuttle buses operated by Universal Coach Line. Breaks are at Tsawwassen Mills: 12:00pm to 12:20pm and 7:00pm to 7:20pm. This additional route from (KPU) in Surrey on 72nd Avenue at 126th Street increases accessibility from a key, central Surrey location with connections to public transit. The complimentary service for shoppers consists of one 29 passenger shuttle bus. Frequency of the service is approximately 45 minutes each way. Ferry schedules change on a regular basis. Please refer to BC Ferries Schedule when planning your trip. We recommend that you arrive at the ferry shuttle stop near Entry 3 (in front of Milestones) well before the scheduled departure time to avoid disappointment. The safety of the passengers on all Tsawwassen Mills Shopping Shuttles is our top priority. Note that the Ferry Shopping Shuttle service is reserved for BC Ferries foot passengers going to or from the ferry terminal and Tsawwassen Mills to enjoy our shops, restaurants and entertainment. The shuttle operates on a first-come-first serve basis, and does feature standing room only for a limited number of people. If the shuttle is at capacity departing from the ferry terminal to the mall, the driver will immediately return to pick up remaining passengers wishing to go to the mall. In the event of ferry delays, the shuttle will not wait and will continue to run on schedule. If your ferry is delayed, we welcome you to wait for the next shuttle, catch the 620 bus and hop off at 52nd St. stop, or hop into one of the available taxis at the ferry terminal for the short 10-minute ride. We welcome families on board the Shopping Shuttles. Please note that babies and toddlers are the responsibility of the parent or accompanying adult and must be properly secured while travelling. Strollers are the responsibility of the passenger and must not block movement in the aisle. Strollers can be folded and placed in one of two luggage storage compartments on board the Shopping Shuttles. Tsawwassen Mills offers stroller rentals for a nominal fee. Service animals, including guide dogs, are permitted and welcome on board the Shopping Shuttles. Pets, however, are not permitted.